$20 with reservation, $25 without. 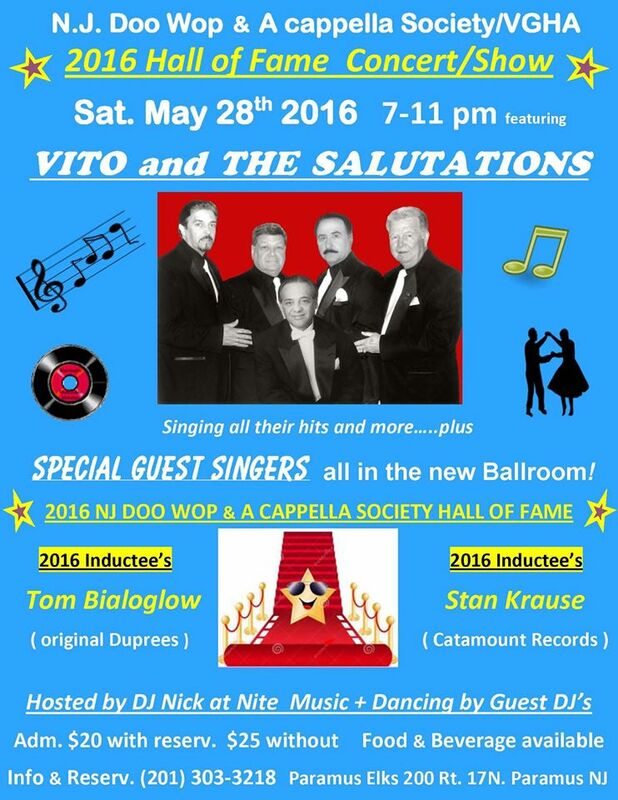 Vito & Salutations will be singing at the NJ Doo Wop & A Cappella Society / VGHA 2016 Hall of Fame Concert Show along with special guest singers. 2016 inductees to the Hall of Fame will be Tom Bialoglow (founding original member of the Duprees) and Stan Krause (of Stan’s Record Shop and Catamount Records). Hosted by DJ Nick at Nite. Takes place on Saturday May 28, 2016, from 7 – 11 PM at the newly renovated Paramus Elks Club, 200 Rt. 17 N, Paramus, NJ. Admission $20 with reservation; $25 without. For info and reservations, call 201-303-3218.